Foggy lenses and winter weather are a bad combination. Nighttime visibility is a major factor in traffic accidents. Weather and road conditions, signage and lighting play a role in driver safety, but there’s something motorists can do themselves to ensure they are visible at night- keep their headlights clean. Functioning headlights allow drivers to see, and be seen. Headlights illuminate anywhere from 160 to 500-feet in front of the vehicle on a clear night. Over time, that area decreases because UV rays from the sun can discolour and cloud the plastic lenses on most vehicles, preventing the sharp blue light to penetrate the fog and instead casting a weak, yellowish glow. Headlight restoration can improve the light output due to foggy and discoloured lenses, and prevent situations where drivers can’t see properly. Not only do dull and oxidised headlights make your car or truck cosmetically unattractive, but headlight glare significantly affects the reaction and recovery times of drivers in addition to lowering visibility distance. It’s no wonder faulty headlights are one of the main contributors to motor vehicle incidents, and that’s why we care a great deal about headlight restoration. Restoring the functionality of your headlights has proven to improve visibility for the average driver. There are different methods of headlight restoration, many sources recommend toothpaste or a mixture of toothpaste and baking soda. 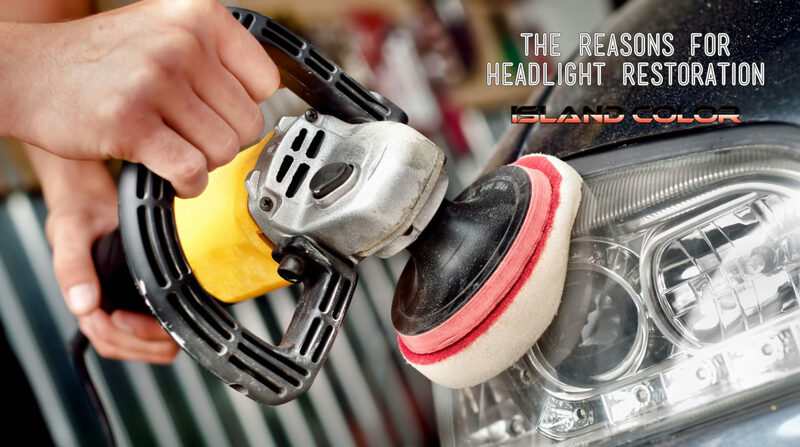 Some DIY solutions are mildly effective, all having the common goal of removing oxidization, surface grime, weathering, and dirt that diminish the output of light from your vehicle’s lenses. There are occasions when lenses require replacement, but before you go through the time and expense consider trying the restoration route first. Are your headlights cloudy or foggy? We have you covered. You can click right here to get a full breakdown of how we fix it, and then click through to make an appointment. It is as easy as that!